At Camp Birch Hill we offer a broad range of activities for our campers to enjoy. Our elective based schedule has a variety of options ranging from arts, sports and adventure. We pride ourselves on being a summer camp that encourages our campers to try everything. Birch Hill gives campers the opportunity to advocate for themselves by changing activities once they are at camp. They have the choice to change their schedule when they want to so that they are always having fun and trying new activities. A lot of our frequently asked questions have to do with our activities at camp. We thought we would shed some light on some of the ones we get a lot of questions about. Today we are going to spotlight three activities that we offer beginning with Photography. Our photography classes are taught by skilled photographers that take their student photogs on an exciting and creative journey into the realm of digital photography. -Each camper is given their own memory card to use during their classes that they can take home with them when they leave. -Campers are welcome to bring their own camera to class however they have access to Canon Rebel DSLR’s with 50mm lenses to learn on and take photos with. -Campers can look forward to learning basic skills about controlling the exposure of their photos by learning about settings such as aperture, shutter speed and ISO. -Campers will be guided through the teachings of photography by learning about portraiture, composure and experimenting with light. The results of the photography classes are stunning because there are so many beautiful things to capture at camp. We publish two ‘Photos of the Day’ in each issue of The Yahoo Times to showcase the creative work done by our campers. Below are photos taken by campers from our summer of 2018 photography classes. Above is a majestic photo of our beloved summer camp dog Toby taken by photography student Michael F from Session Three. Above is a beautiful, vibrant photo of a butterfly taken in our lily garden by photography student Phoebe W from Session Two. Above is a fantastic action shot taken by photography student Aliyah B from Session One. Our acting and improv classes are lead by talented theatre connoisseurs that make each class full of fun and learning. Each session our acting and improv students put on a theatre production for our final night of camp. -At the beginning of each session our Performing Arts Director will hold auditions for campers interested in taking part in the camp theatre production. Everyone who wants to be involved will be given a part in the play. -Campers can expect to be given ample time to learn their lines and prepare for the play. Acting and Improv classes run for two activity periods in a row on the B-Day activity day. -In addition to acting and improv classes we offer Set Design Classes for those who want to be even more involved in the camp theatre production. -Set Design class is taught by two skilled, artistic counselors. 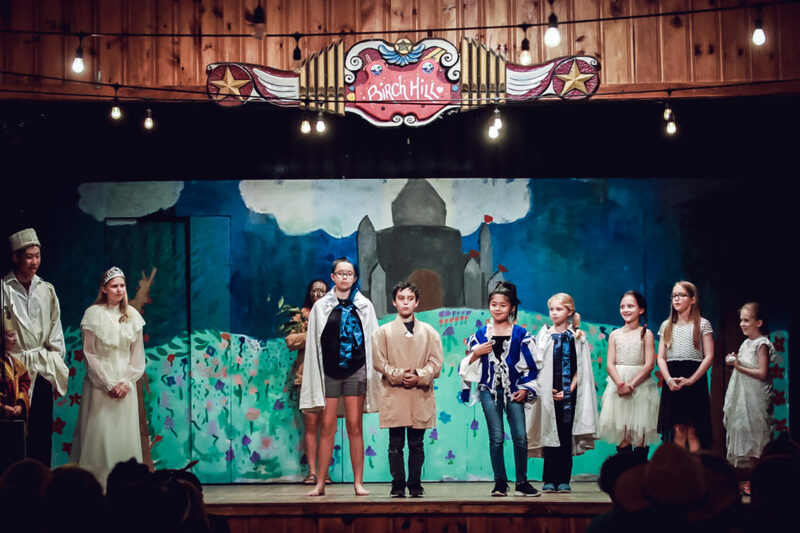 -Campers that are interested in set building, prop making and costume design are able to be more involved in the creation of our camp theatre productions. -Campers are provided with the materials and skills it takes to put on a small production with the guidance of our talented Set Design teachers. Seeing the production come together with the help of campers and counselors is so wonderful. The hard work, talent and enthusiasm that goes into it all makes us proud to offer such a fantastic program area. Below are photos of our three summer of 2018 productions. Sports Broadcasting is a very popular class for those interested in stretching their imaginations into another realm. -During each class, campers walk around camp with their sports broadcasting leader interviewing people about what they are up to and commenting on the fun and games they see in real time. -Sports broadcasters will stand on the sidelines of our sports field or down at the tennis courts commentating on the games going on. -Campers use their imaginations by talking into a microphones at a cameraman who is usually the class teacher. We love hearing what our sports broadcasting class gets up to during evening cove. They see everything and will often shout out campers they saw during games that did something incredible like a bullseye in archery, a goal in soccer, or an epic shot in basketball. We hope you enjoyed learning about some of our camp activities. If you have any questions about these activities or anything else please feel free to send us an email at [email protected] or call the camp line (603) 859-4525.